Getting to bed late last night I was afraid I wouldn’t wake up if Lucho, our expedition leader made an announcement for animal sightings. Lack of sleep, plus Dramamine to help with the motion sickness, made me an extremely exhausted teacher fellow. Little did I know, in just a few short hours, Lucho would indeed announce a special bear sighting. At one a.m. 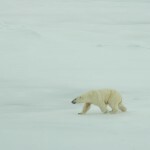 I did wake up to his, “Good morning, good morning,” and heard the announcement that there was a mama bear and three cubs out on the ice. Triplets! That is so rare. The likelihood of all three surviving is not high, but we can hope. I grabbed my gear and headed up to the bridge this time so I could stay warm and my camera wouldn’t fog up again. 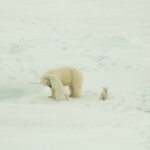 The staff said mom looked healthy which will help the cubs as they are still nursing. 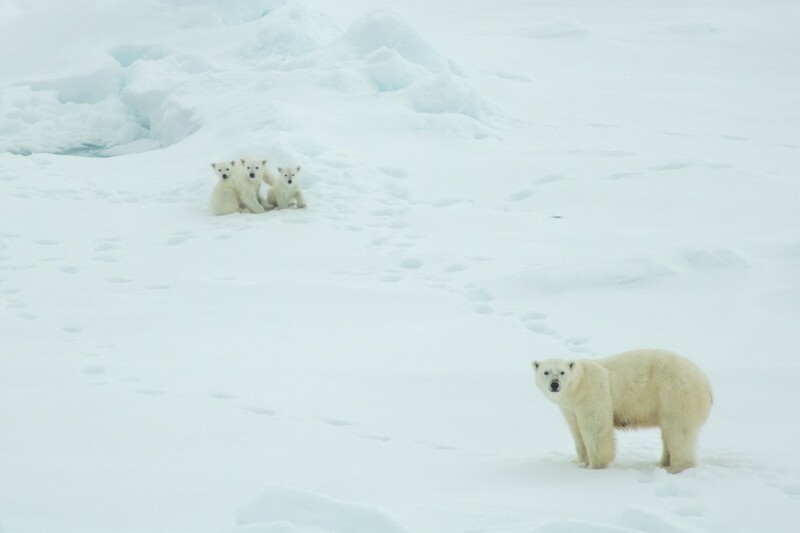 The cubs were probably about 6 months old and school was in session. 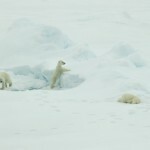 She was hunting seal and teaching her babies to be excellent hunters, a key to bear survival in the Arctic. 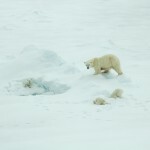 It is amazing to observe first-hand a powerful mama bear teaching her cubs to hunt. 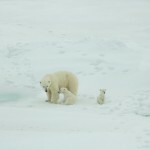 The three cubs were watching and waiting while she stalked a seal. She was very patient and still for long periods of time, just waiting. At one point she bounded for the water’s edge but the seal must have been too fast because she walked away. 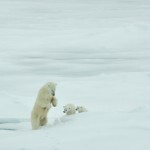 As soon as she ran for the seal the cubs bounded after her. At one point she stood up on her hind legs and pounded down into the snow with her front legs. 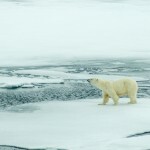 She had smelled through the ice and snow to try to pinpoint the seal. What a great bit of knowledge to add to our five senses unit. 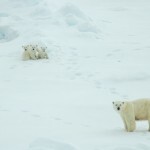 “Can You Smell as Well as a Polar Bear?” At one point the cubs were playing around and she “yelled at them” and they stopped and sat quietly, patiently. 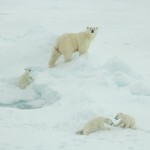 When the unsuccessful hunting was over the cubs displayed curiosity and played around in the snow, copying mom’s hunting techniques. Adorable is truly the only word to describe their efforts when instead of punching through the ice there were several face plant moments in the snow. This did not seem to deter their efforts at all. It really reminded me of human children’s curiosity, playfulness, and dependence on adults. In the end the seal lived to see another day, but we were fortunate enough to witness the hunting process. 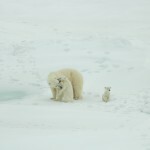 When the lesson was over, the littlest cub stuck close by mom’s side while the other two were playing around and not keeping up as she walked away. We had a good laugh about that in the bridge because one of the guests suggested the one sticking close to mom was the girl, and the two mischievous ones were the boys. I relate to that being the only girl with two older brothers. That’s when one of the naturalists spoke up saying that probably was true, not because of the gender roles we had jokingly assigned them while anthropomorphizing, but because the girl was most likely the smallest one biologically. 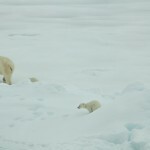 The bears were hunting on sea ice which is an essential part of the polar bears existence; it enables them to hunt seal more successfully than in open water. 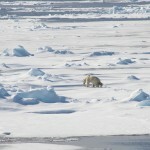 In the summer months, when there is less ice, bears may go months without eating. 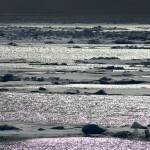 With less sea ice this year it may be a very lean summer. 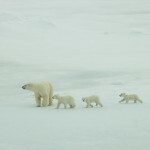 Hopefully the mama bear and three cubs will get enough food to survive. 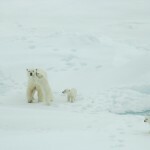 They are part of the cycle that helps keep the Arctic ecosystem in balance. 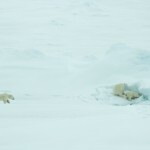 For my RPS team…cue Mrs. Nakano singing, “The circle of life.” We observed the bears for about an hour and a half and then as they disappeared into the distance, I grudgingly went back to bed. It was rather hard to get up in the morning. I got a late start on breakfast and was still eating when yet another bear was sighted. Lucho said it was far off so I took my time. I took a little too long. I got up to the bow in time to see it walking away. He was said to be old and thin. The sky was bright and the photos of him turned out a little better than the ones of the other bears. Daily I am trying to improve my photography skills. 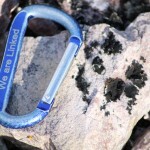 Hopefully by the end of the expedition I will have at least one good photograph to claim as a quality piece. Thankfully Rich, the National Geographic Photographer on board has been helping me along the way. I wish humans did not need sleep. 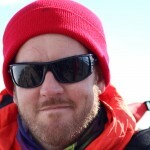 There are so many amazing opportunities to learn on this expedition including lectures by experts in the field. Later in the morning I slept through part of Carl Eric’s lecture on the Svalbard and decided I needed to take a nap after that. I believe I missed Magnus’ entire lecture on polar bears which would have been really informative, especially after our encounters over the last twelve hours. 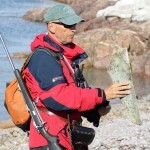 In the afternoon I was blessed to go on the “long hike” with Carl Eric, a patient and knowledgeable naturalist in the Sorgfjorden. 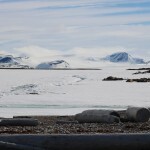 It is a beautiful landscape on the northern border of Spitsbergen, with long low plains of snow and ice in between mountains of rock and snow. There was an abundance of birds that I still need help to identify, but other than that we did not see any animals this afternoon. Scattered along the pebble beach there were driftwood logs. Logs? Yes, logs. There are no trees on the Svalbard but the ocean currents carry the wood from other places like Russia to remote beaches like this. The logs were used to build shelters when necessary. 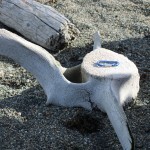 Carl Eric showed us whale bones including a vertebra. Look how big it is compared to my carabiner! 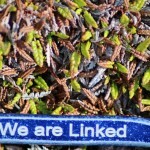 There were also swatches of plants here and there along the beach as well as lichen. 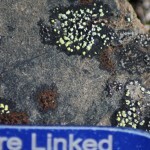 I didn’t know that lichen were not plants but a fungus. I would like to learn more about this to help my brain differentiate and help my students when we study plants. 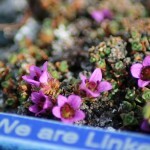 As I’ve written before in earlier posts, plants in the arctic are adapted for the cold climate. They are compact and flowers have both male and female parts to aid with pollination. Dennis, the plant expert on board agreed to be interviewed about them. Unfortunately there is a lot of background talking going on, hopefully you are able to tune it out. Dennis is a character. I really enjoyed listening to him speak. I generally had a grin on my face while he was talking and you can even hear me laugh at the end of the interview. 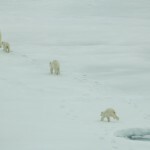 While walking in the Arctic it is important to be vigilant, stay with the group, and stay between the guides. 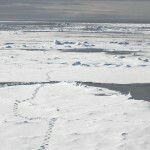 You never know when a polar bear will decide to wander past. They check the landing spots beforehand but that doesn’t mean it will stay clear. In my enthusiasm for snapping photographs including with the 360 camera I kept being the last one before Santiago, our rear guard. I believe I apologized several times for holding him up. 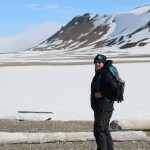 I did get some fun 360 images of our walk across an Arctic stream and snowfield though. It was breathtaking and expansive. It made me appreciate how big Svalbard is and how hard it would be to live here. I haven’t figured out how to imbed them on here yet so here is the link to one of the 360 images. You can navigate up, down, and all around with your mouse, arrow keys, or if you have a touch screen, with your touch. According to Adam, another naturalist on the hike, Sorgfjorden means Fjord of Grief. It didn’t look very sad to me until we started seeing the garbage on the beach. Unfortunately, ocean currents make it possible for garbage that ends up in the water to journey to even uninhabited places. Just being in the water is bad enough, let alone traveling to remote archipelagos. There are even garbage islands in our oceans! So sad. 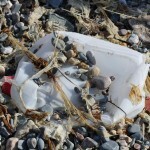 There were milk jugs, netting, and other miscellaneous bits of plastic all along the beach. This is very unhealthy for the land and sea animals. They eat the bits of plastic thinking it is food and can get caught in the netting. 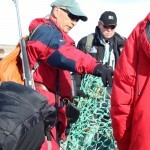 Fortunately, the staff collected much of the litter and brought it back to the ship to be properly disposed of. My students and I learned about land, air, and water pollution last spring. Part of that study was watching Are You Eating Plastic? I highly recommend watching it. These beach finds are prime examples of how humans need to do a better job of taking care of our waste, including making less of it. I will be sharing photographs I took of the pollution with my students next year as well. Hopefully, learning about how much our world is connected will help them be aware that what they do matters. Humans can either help or hurt. Which will you choose to do? WOW is all I can say….